Appearing in the June 2017 performances of Approaching Ecstasy at the Cornish Playhouse will be Cornish graduate Jim Kent. 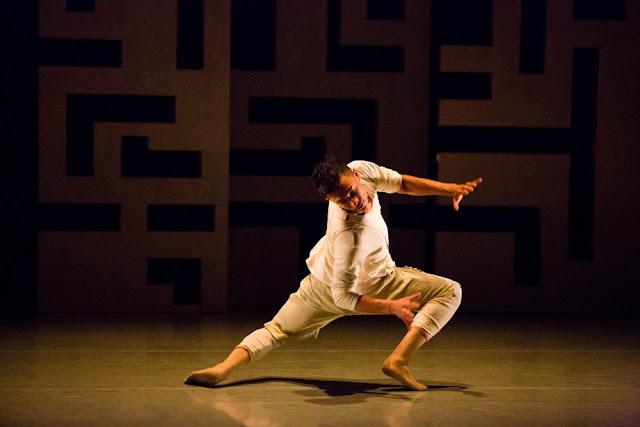 He has been a member of Olivier Wevers’ award-winning contemporary dance company Whim W’Him for the last seven seasons, dancing in numerous world and Northwest premieres of works by contemporary choreographers. Approaching Ecstasy is based on 18 poems by Constantine P. Cavafy and imagines what it must have been like to be a gay man in Egypt a century ago. The love poems, chosen and translated by Eric Banks (artistic director of The Esoterics) and choreographed by Wevers, are performed by the dancers of Whim W’him, The Esoterics choir, and the St Helens String Quartet. Kent has worked with local choreographers Mary Sheldon-Scott, Wade Madsen, Mark Haim, zoe | juniper, Dayna Hanson, and Saint Genet. He appeared in Hanson’s feature-film Improvement Club (2013) and choreographed for the feature-film Laggies (2014) shot in Seattle and directed by Lynn Shelton. Rosemary Jones: Why did you decide to go to Cornish College of the Arts? Jim Kent: I was in my second year of college at Minnesota State University as a theater major/dance minor when I decided that, yes, I did want to dance full-time and needed to start looking for an immersive training program. Cornish was a great fit because of the split-curriculum between classical/contemporary dance. When I came to Seattle to audition in person, I fell in love with the school, the city, the people, the faculty--it was the most clear life decision I've ever made, probably. Rosemary Jones: What do you remember best about classes at Kerry Hall? Jim Kent: I just really loved dancing a ton. There was no shortage of technique classes and that's what I craved. It's such a diverse population for a dance department--everyone is coming from a completely different place and is interested in something different, so finding my niche was a really fun discovery process. I also really loved the focus on longevity and health being a central theme--we were all given tools to be able to be dancers until 50 and beyond, if we wanted. Rosemary Jones: How would you characterize the dance scene in Seattle today? Jim Kent: I think that the artists in Seattle have to be more and more resourceful, more so now than before. Most artists I know don't limit themselves to just one craft--they try to diversify into other forms, creating more synergy and possibility for artistic potential. I think that dancers in particular don't want to dance for free anymore; they have asserted their requirement for compensation (which is awesome) yet it's harder and harder for the traditional company model to exist, so staying activated is the challenge for most dancers in this city. Also, commodity and art and branding are speaking to each other in new ways in order for there to be a wider reach. Longevity and support are indispensable, and finding creative ways to market to the masses is itself creating really beautiful expression/visibility through technology, whether it's a conceptual photoshoot or an elaborately produced trailer for a one night only performance. Rosemary Jones: You danced in Approaching Ecstasy in 2012. How has the piece grown or changed during this reset? Jim Kent: When Approaching Ecstasy was first mounted, the company was more project-based. We were on a pretty tight schedule and it was an almost uncomfortably fast creation process. This time around, we are a full-time dance company, working 6 hours a day/5 days a week, spanning 7 full weeks. It has been really satisfying to tackle this work with more access to tools I've developed with my own physical training and education with the company. There's also the aspect of being so much more familiar with the other bodies in the room. When we partner, it's with so much more care and we have established an awareness and consideration for each other's bodies that just isn't possible without many hours of rehearsal together. Rosemary Jones: You've worked with a variety of choreographers at Whim W'Him, including Cornish alumna Kate Wallich. How would you describe Whim W'Him's approach to new work? Jim Kent: We dance in nine new creations a year, and the fact that we always do new work for every program is my favorite part of the company. Whim is really dedicated to providing a platform for new work to exist. For the Choreographic Shindig program which happens in September every year, the dancers in the company choose their favorite three choreographers from a pool of about 100 applicants. It really allows the dancers to have agency and voice by putting the decision in our hands, and for new and exciting work to be developed and fully produced. Because I get to work with so many choreographers from near and far every year, I truly consider this company to be a continuing part of my education as a dancer and human. This is the company I dreamed about when I was in college.